I do my paintings using Brushes App. They are done on my iPad. That means the original image is on a computer rather than on paper or canvas. I print them off on a good quality printer to good quality paper (or canvas). I then have them mounted and framed and hang them on my wall. I have chosen, almost from the beginning, to display them on the web as photos of the paintings. To put the computer image up would be tantamount to giving my art away and that does not seem right somehow. 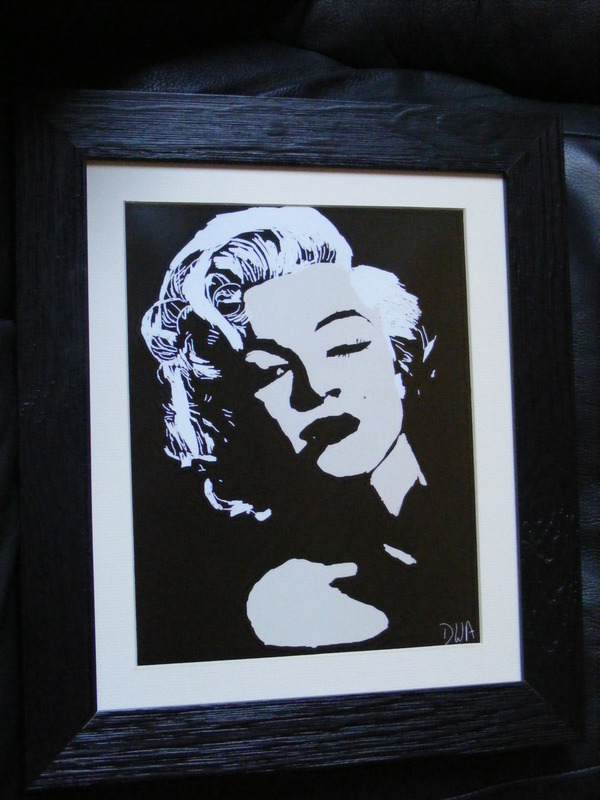 I could sell framed copies (I have sold some) but to be honest I have no motivation to put in the effort and energy which doing that requires. I would much rather use that effort and energy in making more paintings. 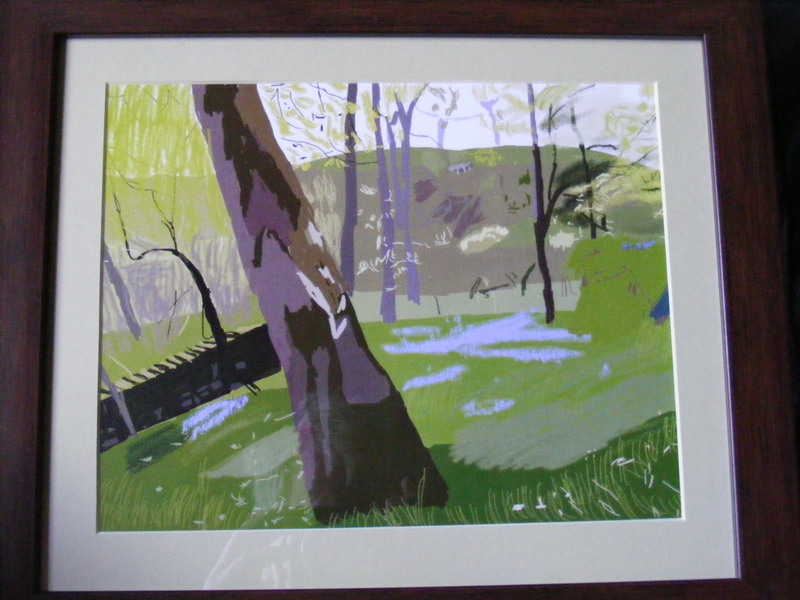 I have also had requests from people who would like particular paintings on their own walls and I have invariably allowed them to use the computer image to print them off. 2. If you would like a copy for your wall then email me and I will send you a computer image. A. You take a photo and email it to me. That would be nice for me. B. You make a donation to a charity of your choice. I have no desire to know the amount (none of my business) But it would be nice to know which charity. At the end of The Prom. 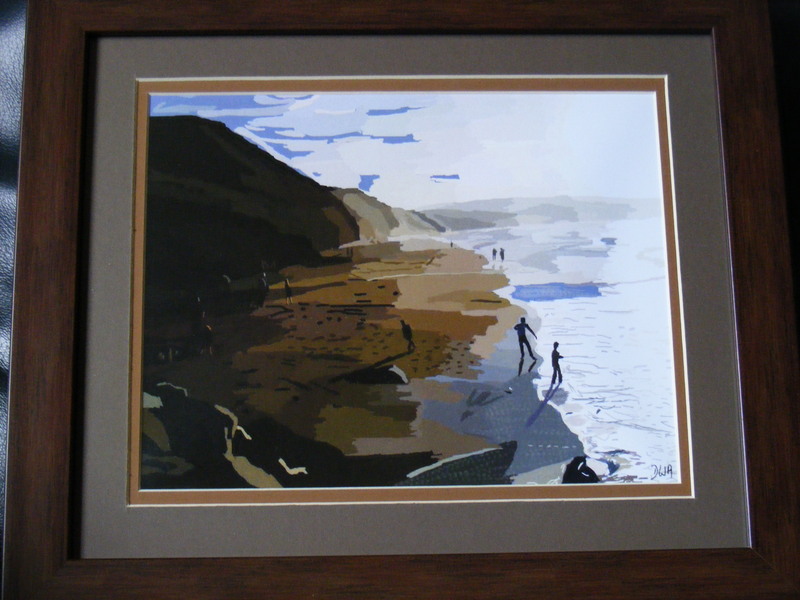 This is the third of my three favourite beaches to be painted. 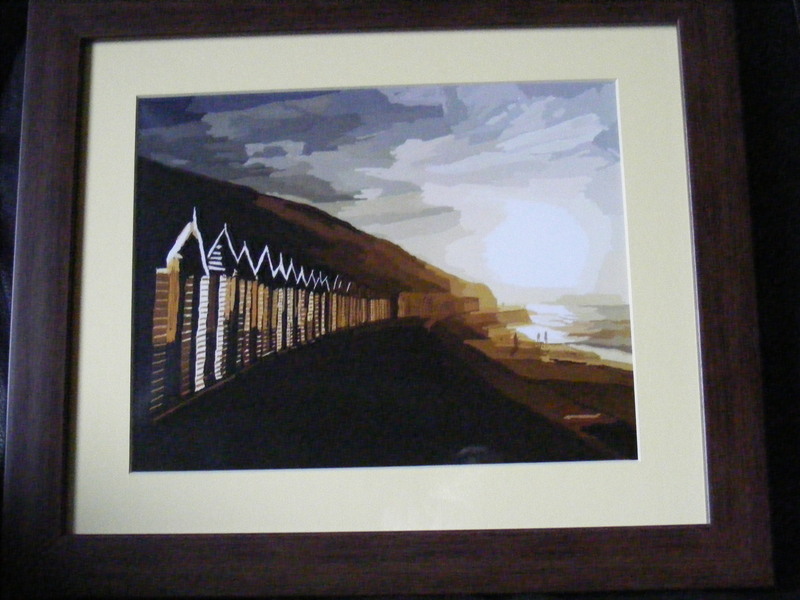 You will find it if you step into my Whitby Beaches Huts paintings and walk past the beach huts towards the sun. It is one of my favourite places in Whitby – normally quiet – you have to walk to get there!! It is where I go when I have need for peace and for solitude in order to restore myself. Many hours I have sat there communing with the sun, the sea and the sky. I always return feeling much better. It, like my other favourite beaches, has appeared in a number of my poems. re-appear in blinking of the light. of those I knew and loved. so recently departed from this life. a sense that she is here, with me, today. When you visit Whitby and look out to sea you are, by a quirk of the coastline, looking north rather than east as you might expect. The result of this is that around mid-summer the sun rises out of the sea and sets in the sea. 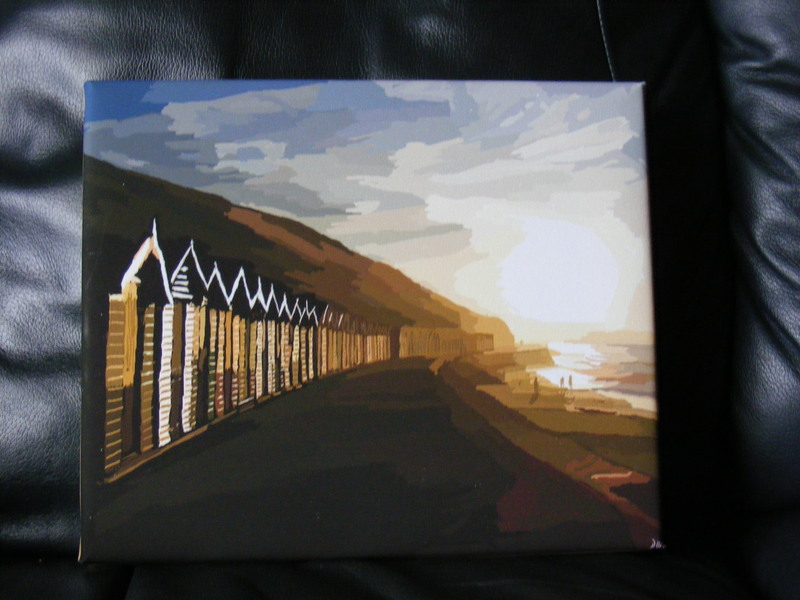 I have spent many contented hours either up on the top or down by the beach huts watching sunsets. This place, down by the beach huts, carries many happy memories for me and the painting on my wall helps bring them all back. 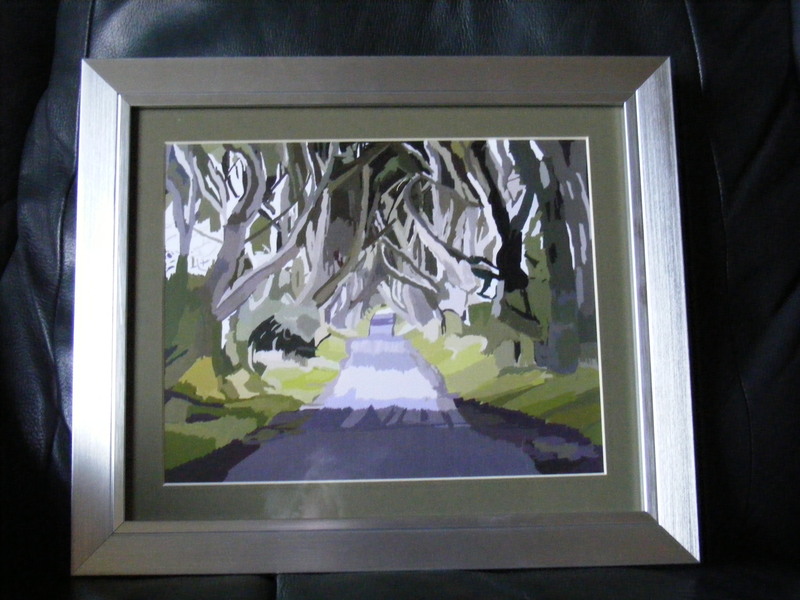 The Dark Hedges are near the village of Armoy in County Antrim, Northern Ireland. They are not far from the Vanishing Lake and the Giant’s Causeway. No shortage of myths and legends there then!!! Go research. I was first driven through this roadway by my father when I was a child and the magic of that place has stayed with me ever since. I had the chance a few years ago to go back and find the place again – the magic had not diminished!! This particular Fairy Dell is off the back road between Otley and Ilkley not far from the Bluebell Woods. You have to walk to get there and although not far from civilisation you could be in a totally different world. which is useful to me. This poem is the first poem in my first book of poetry – ‘Walking into Eternity’. It is also, if you like, my signature poem in that if I was doing a poetry reading I always started with this poem by way of introduction. 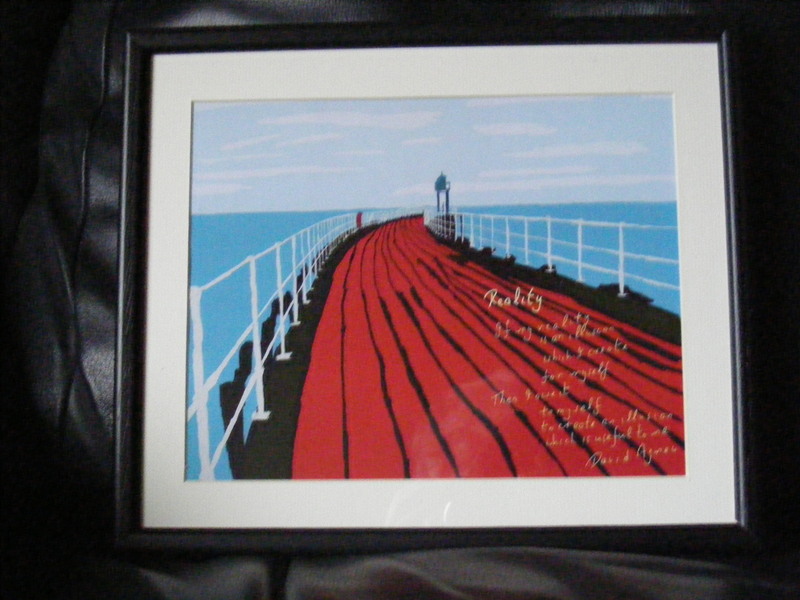 Given the nature of my Whitby Pier painting it seemed like the two made a perfect match. I have printed this painting off at poster size and it is pinned on the cork board in my kitchen where I can see it every day. 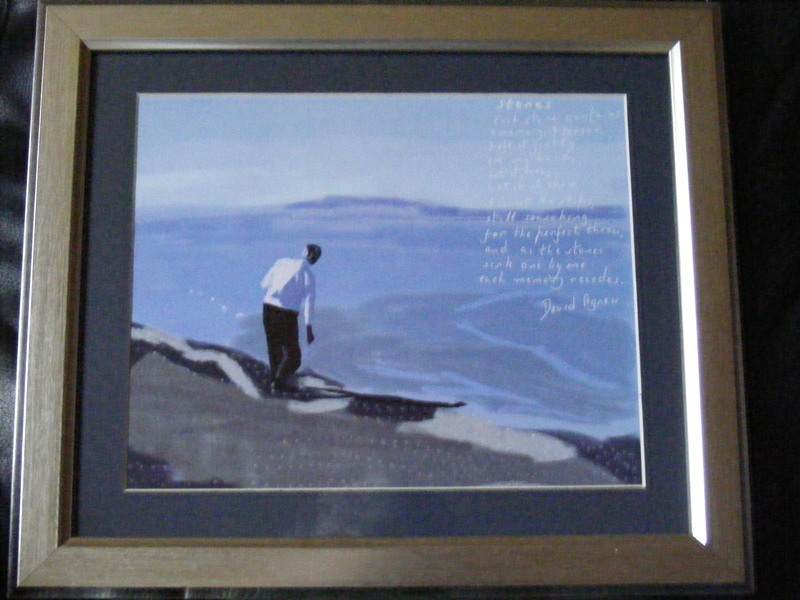 Carrying on the theme of embedding poems in paintings, this poem was written specifically to do just that. The original painting is my painting of Belfast Lough – posted previously. I have written a number of poems inspired by that place but they were too long to include in the painting. You are currently browsing the Belfastdavid's Weblog blog archives for March, 2013.